I came across this stunning video of one of my favorite cities. My family is from Hungary originally and I still have family in Budapest. Going back again would be a wonderful time for me again. If you don’t know anything about this very lovely interesting city then you really should. Here is a very basic summary of some highlights about this city. The beginnings of this interesting city go back to the ancient Aquinicum settlement. The Roman ruins are open to visitors and are located about 20 minutes by train outside the city. Budapest was formally founded as the city we know today in 1873 and it is the largest city in Hungary. It is one of the largest and most beautiful cities in the European Union and the world. Conde Nast Traveler rated it as the number two their recent best cities in the world article. UCityGuides named this city number nine in their Most Beautiful Cities of the World article. Budapest was the second capital to Vienna in the Austro-Hungarian Empire. The two cities are about a pleasant 5 hour drive apart which I did when there last time. Another name for Budapest is “the Paris of the East”. I can see why people call it that after having been to Paris. It’s a very livable city of over 202 square miles and 1.7 million residents. In reality it is comprised of two cities really, Buda and Pest divided by the not so blue Danube River. The Buda section of the city has Castle Hill where a very large castle, Buda Castle, which sits up on the hillside overlooking the Danube River built in 1265. I toured the castle and the whole settlement surrounded it quite some time ago. The frescoes on the walls there are the same but touched up as over 700 years ago. Take my word for this, if you are sensitive to smells you may not want to go down into the original wine cellar up on Castle Hill. I look forward to my next visit to Hungary and Budapest. You need to add this interesting city to your must see list! I just love getting out of the house to explore on the back roads. I usually remember to take a camera in addition to a smartphone along. When you are exploring you never know what you will find! Just north of New York City in Westchester County is a favorite ride. Get off the main roads of Interstate 287/87 and get on route 9A north and wind through the very scenic Hudson Valley. It’s especially scenic this time of year with the trees in their autumnal splendor. Maybe stop at a farm stand or pick some apples too or go antiquing. All up to you! Nestled in the heart of the Hudson River Valley near Tarrytown is a quaint town known as Sleepy Hollow. Until 1996 Sleepy Hollow was known as North Tarrytown. 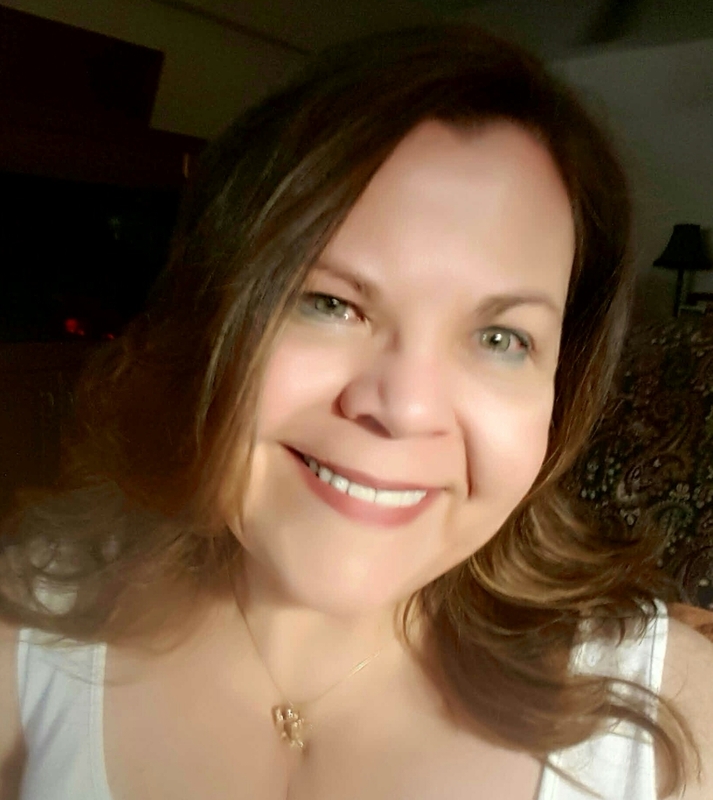 The whole Hudson Valley Region sits on the banks of the Hudson River and is ripe with Revolutionary War battles and history. The area was originally a Dutch settlement. This is the same town where Washington Irving’s tale “The Legend of Sleepy Hollow” is set. There are a number of interesting places to visit in Sleepy Hollow and surrounding areas such as Kykuit the Rockefeller family estate set on the Hudson River with it’s vast views of the river. Sunnyside is the estate of Washington Irving and there are a number of other estates along the Hudson River. Philipsburg Manor, which was a successful farming, milling, and trading, center owned by the Philipses in the center of Sleepy Hollow. If you have not had the opportunity to explore this are I would recommend you do make time for a visit. I will not tell you the entire tale here, just a snippet in case you have not heard or read it. Ichabod Crane was a teacher who one very dark night was heading to a party at the Van Tassel’s residence hoping to woo Katrina Van Tassel. Suddenly out of the shadows came the Headless Horseman, local legend claimed him to be a fallen Hessian soldier buried in the nearby church cemetery in search of his head. Ichabod was chased over a bridge trying to get away from the Headless Horseman. The Horseman hurled his burning jack o’lantern head at Ichabod and chased Ichabod to the Old Dutch Church. The bridge is no longer in the center of town however the Old Dutch Church built in 1685 is. This is the oldest church in all of New York State. The cemetery surrounding the church is quite large and holds a great number of famous final resting places for business legends including Brooke Astor, The Helmsley’s, Andrew Carnegie, Rockefellers, and even Walter Chrysler founder of Chrysler Auto Company. Tours are given of the church and cemetery including some at night, or, you can purchase a map and wander around yourself. There are a number of seasonal events hosted in Sleepy Hollow, which reference that legendary tale. 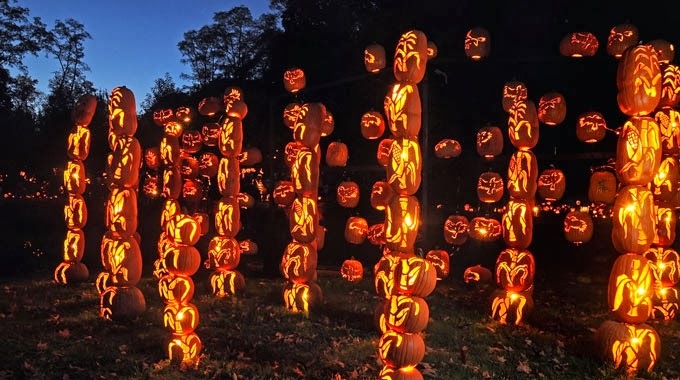 This year and every October Sleepy Hollow hosts a fabulous event The Great Pumpkin Blaze with more than 5000 blazing jack o’lanterns and is being held for 25 nights this year. This is always a sell out event and tickets are necessary. It is mostly handicap accessible also. 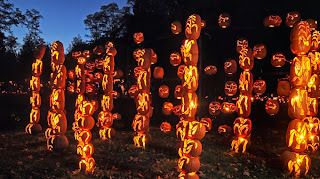 Another seasonal event held yearly is at Phillipsburg Manor is Horseman’s Hollow. Ghosts and ghouls abound and will try and scare you out of your wits…. all in fun of course, and not for the faint of heart or small children. Or perhaps Irving’s Legend would be an event you would like. A reading of The Legend of Sleepy Hollow by a master story teller and held in the infamous Old Dutch Church where Ichabod fled. If you can not get there this time of year, how about a summer event like Pirates of the Hudson in early July, or Scrooge telling his story in the Old Dutch Church just after Thanksgiving and throughout December? Family fun for sure! This is a great area to visit for families, take photos, learn some history, step where many of the most famous people have the 19th and 20th century walked. You do not always have to go far from home to have a great time. There are many other towns along the Hudson River Valley on both sides of the river like Piermont….but that is a story for another day. Get out and explore! ©2013 - 2016 Janz Media LLC All Rights Reserved. Travel theme. Powered by Blogger.